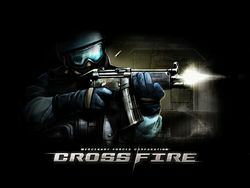 CrossFire or Cross Fire (CF) (Simplified Chinese: 穿越火线; Korean: 크로스파이어; Japanese: クロスファイア; Vietnamese: Đột Kích) is a tactical first-person shooter online PC game developed by South Korean FPS developing groups SmileGate and Neowiz. The game was released in China by Tencent, with Tencent as the exclusive agent service company. Tencent operates the game through the Internet, with service areas covered and the networks supported by China Telecom and China Netcom. The tests for its software bugs were started publicly in April 2008. It is normally believed that players of this game will naturally associate it with Counter-Strike. CrossFire features two International Mercenary Forces, locked together in an epic global conflict. Players assume the role of either a Black List terrorist or Global Risk mercenary, joining an online team that must work together to complete objective-based scenarios. There are six online modes: Team Death Match, Search and Destroy, Elimination Match, Ghost Mode, Free-For-All and the all-new Special Mode . Based on their performance in-game, players will receive experience points and be promoted through various Military Ranks. Players will also have the ability to customize their character's equipment and appearance through CrossFire's in-game item shop. Upon release, CrossFire will be free to download and playable online.